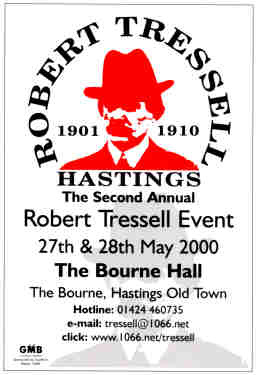 The Second Annual Robert Tressell Event: was a most enjoyable weekend, even more of a success than 1999's event which was was a success way beyond our expectations and has laid the foundations for what we hope will now become an annual event. Our plan is to alternate between two day and three day festivals, this alternation is purely because of the extra amount of organisation that is needed for a three day event, if we had to do that every year it would become an increasingly onerous task. 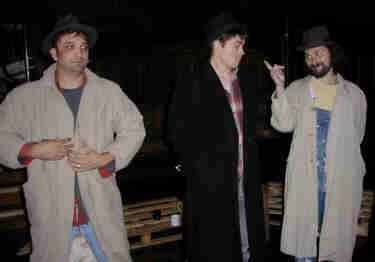 Outside the Festival weekend, the group continues to try to get the work of Robert Tressell more widely known and to promote the principles and beliefs that he put forward in The Ragged Trousered Philanthropists. One of the most important achievements for us this year was the purchase of a copy of the book for each of the Secondary Schools and Sixth Form Colleges in the Hastings and St Leonards catchment area. By introducing the work to a new generation of younger readers we can ensure that the book retains its continuing popularity and relevance. During the forthcoming year we hope to expand this work further, by placing more books and hopefully becoming involved with education projects. The proceeds of this weekends Event will go directly to that area of work as well as to organising next years Festival. 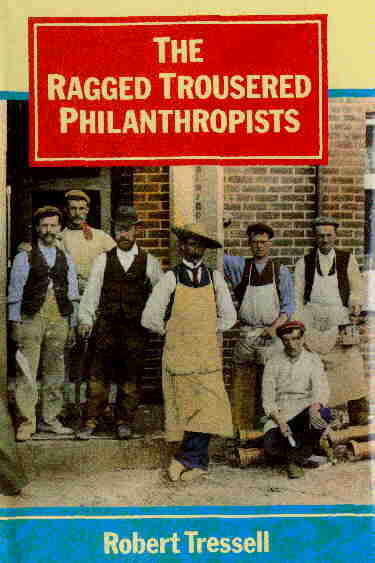 At last year’s event we hoped to launch the Raffle for a copy of the Ragged Trousered Philanthropists signed by the Cabinet of 1997. However, due to the delay in the book actually being signed and the very stringent Lottery rules that must be enforced, we were unable to start the process until this year. Raffle tickets will be available all weekend from any of the organising committee. Irrespective of your political beliefs this book is a fascinating historical momento and we are lead to believe by those who claim to know about autographs that it will be of significant value in years to come. Not to mention the fact that the proceeds are going to a very good cause! 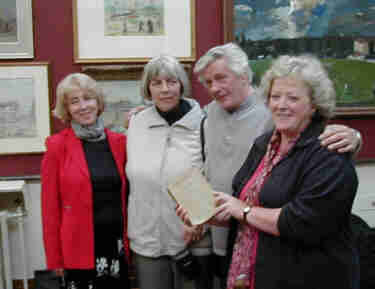 One of the highlights of the festival was the start of the raffle for a copy of the Ragged Trousered Philanthropists. 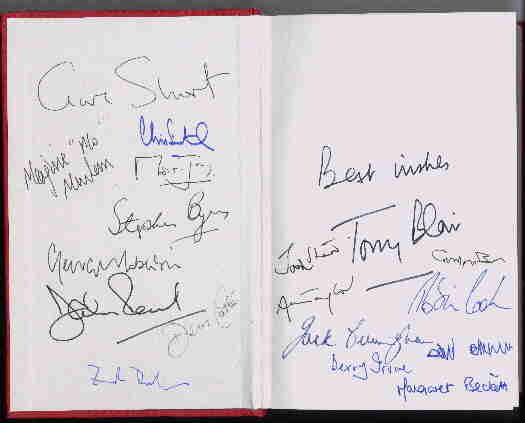 This copy has been signed personally by all members of the Tony Blair's cabinet - Just click here or on the thumbnail above and see how many names you recognise! A truly historic book. 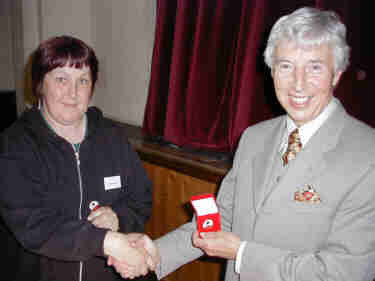 The draw took take place 29th September 2000 and was won by Pamela Mills. We have also commissioned a commemorative badge of Robert Tressell; this is something that a number of people asked about last year and that we felt would be a suitable way of commemorating the great man, we hope that you like them. They are priced at £3 and are available from the same stall as the Raffle Tickets. The Company who are providing us with the badges also have a stand with examples of their work for sale, we are planning to commission some of the “presentation” type badges, possibly in time for next years event, if you would be interested in these it would be useful for us to know in advance. Currently we are also looking at the possibility of having commemorative mugs made; if you have any suggestions for other things that you would like us to do in future years please let one of us know or write it down when you sign the visitors book - we always welcome new ideas. Similarly, if you would like to become more involved during the rest of the year we would be delighted to hear from you. We want to take this opportunity as well to thank our sponsors; we have had continuing and generous support from the Hastings and East Sussex Branch of the GMB as well as the Southern Region of the GMB. This support has not been purely financial; it has been moral support also as well as practical help and advice. Particular thanks are due to Gary Smith, Regional Organiser from the Brighton office (and your minibus driver for the weekend!) and Derek Hunter, the Regional Secretary for the Southern Region. 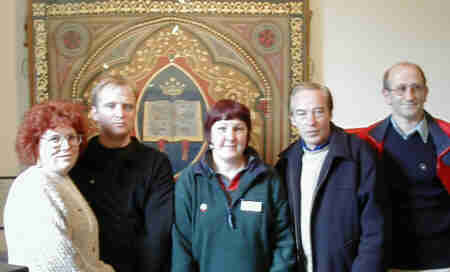 Pictured in front of the Tressell Mural in Hastings Museum, from the left, festival organiser Dee Daly, Gary Smith, festival organiser Susannah Farley-Green, Derek Hunter and festval organiser Neil Bates. We have also had generous donations from the Euston Branch of the TSSA and from a number of individual supporters. Similarly we have had the practical support and help of Kevin Boorman and his team at the Marketing Department of Hastings Borough Council. We are also very grateful to the Curator of Hastings Museum and Art Gallery, Victoria Williams and her team for the special exhibition of the Fred Ball Archive, which has been arranged for Sunday morning. Thank you also to our speakers, some of whom have travelled a considerable distance to be here, finally thank you to all those others who have worked so tirelessly to make The Robert Tressell Event happen. We hope that you enjoy it. Clive is a respected historian who has a particular interest in Working Class history, particularly in the Hastings and Eastbourne area. Those of you who attended the 1999 event will remember Clive’s excellent talk on “George Meek, Eastbourne’s Robert Tressell”. 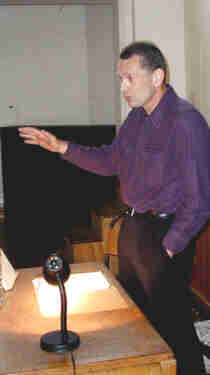 This year Clive's talk was about Working Class Education in Sussex at the turn of the Century. 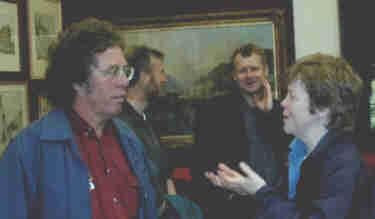 John Nettleton, with members of Fred Ball's family and (right) Cathy Walling, Assistant Curator of Hastings Museum. We are thrilled that John was able to travel down from Liverpool this year to be with us. John was one of the driving forces behind the erection of the beautiful Grave stone dedicated to the memory of Robert Noonan and the others who were buried in the same plot. He has been a lifelong champion in the effort to broaden knowledge about the life and work of Tressell. 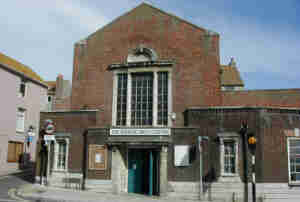 The Fred Ball Archive, Hastings Museum & Art Gallery. This was a rare opportunity for us to see the amazing wealth of material left to the Borough Museum by Fred Ball. Fred of course was the writer of One Of The Damned the wonderful Biography of Tressell and it is due to him that we know as much as we do about Noonan’s life. At the time Fred started his research nothing was known about Tressell, not even that he had another name, over many years and through tireless research Fred uncovered the life story that we now know. We hope that this morning will be a fitting tribute to two remarkable men. 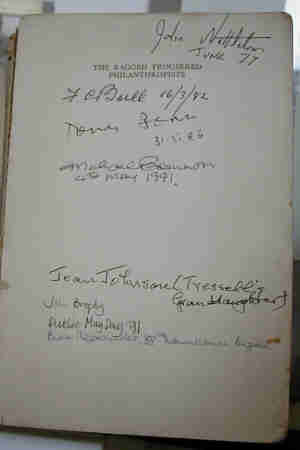 John Nettleton is seen above having just presented the Museum with his own copy of "The Ragged Trousered Philanthropists", which was a proof copy originally presented to Bill Alexander of the International Brigade and the flyleaf has some remarkable signatures. Once again we would like to extend our very grateful thanks to Victoria Williams, the Museum Curator, to Cathy Walling and to the museum staff, for their generosity in arranging this special exhibition and opening the Museum out of normal hours for us. Councillor Jeremy Birch, Lead Councillor For Education, East Sussex County Council. Jeremy was talking about current issues in education and the lessons that can be learnt for education from Tressell and his work. Jeremy is the Borough Councillor for Wishing Tree Ward and the East Sussex County Councillor for Wishing Tree and Silverhill Ward. Steve Peak and Maire McQueeney, who led two of the Tressell walks during the weekend. We hope that those who attended enjoyed the weekend and it was great when we got to put faces to names and voices.